What is Enterprise Resource Planning (ERP) Solution? 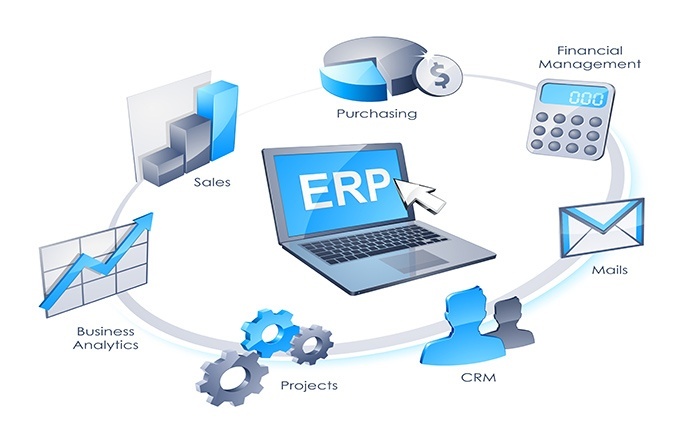 The term Enterprise Resource Planning, or ERP for short, has been around for years. However, if you are not working in the manufacturing industry or for an enterprise software provider, you may not be familiar with the term. You may have pondered what is ERP? What does this solution entail? How can ERP benefit your business? This article is for you! ERP is a collective of integrated applications created to essentially aid businesses in the day to day administration and management processes. The term ERP was coined by Gartner back in 1990. Its precursors were material requirements planning and manufacturing resource planning systems, and as the name implied, used specifically in the manufacturing sector. The system was later evolved to expand beyond its four walls and now consists other back-office functions like accounting, marketing, and human resources to the ERP system today. ERP systems promote seamless interdepartmental communication, allow every user to see only one single version of the truth. In the earlier days, ERP was designed with a heavy focus on large enterprises with a big budget for IT investments. Nowadays, they also cater for small to medium-sized businesses to further expand the market share and a variety of usages for their ERP systems. Data from an ERP system is updated in real-time through a common database to allow a smooth data flow across various departments, thus, significantly increasing the collaboration. The shared database enables ERP to track and support all aspects of the business: cash flow, raw materials, productivity, order statuses, supply chain, human capital, etc. Furthermore, the system also allows you to set spending budgets and compare with the actual costs within a certain time frame. Thus, you have a higher control over the costs your business generates. One misconception about ERP is that since everybody can gain access to the data, there will certainly be issues with data security sooner or later. Enterprises have full authority of whom they are allowed to gain access to a certain data, and to what extent. For a certain individual to go beyond their level of authority, he/she needs to pass series of security gateways. Starting an ERP project can be hefty confusing. Before your organisation even decide to deploy the ERP system from a specific vendor, there is a list of criteria you may want to take into account to ensure the project is a success. Management approval: obtain the cooperation of every department as well as the “go” command from your C-level executives. Establishing an ERP project team: comprises of people who have an in-depth knowledge about the project and the organisation. Choosing vendor and product: the selection process is best to include different viewpoints and opinions due to the fact that this is a strategically important decision. Single ERP suite vs. best-of-breed: do you need to change any part of your business process to fit with the ERP package, or your business has a competitive edge, and the system does not have the capability to fulfil your need? Managing organisational change: implementing an ERP system is more than just changing your IT system, it changes the way your employee does their daily tasks. Data management: ensure your organisation possesses one complete, as well as accurate, master data prior to migrating it. Testing the system: at every phase of the project, there should be a test. For example: how UX design reacts to a certain transaction; end users test; a test to determine the credibility and the completeness of your master data. Controlling expenses: licence fee, consulting cost, annual maintenance fee, training costs, IT investments, etc. what are those even mean? Understand success: there are many dimensions that need measuring in order to clearly announce your ERP project is a success or not. ERP post-implementation: this is the time when you review the transformation and be prepared to scale for future expansions. On average, 60-90% of ERP projects fail, causing irreversible damages to the businesses and casting an overshadow of fear for any future transformation project. In general, the causes of ERP implementation failure can be categorised into two types: business and technical. It is important to remember that an ERP project is not an IT project, it is a business change project, and it has to be approached from the business end. Business issues tend to revolve around poor project management, poor consultant effectiveness, neglecting the company’s current culture, and misalignment with top-level management. The technical issues during an ERP implementation can originate from a mismatch between expectation and the reality and overlooking the sheer volume of the organisation’s data. To overcome such predicament, it is critical for businesses to conduct a thorough gap analysis to determine how well the new ERP system can fit in and close up the current gap (up to a certain degree). You can also request to use your own data to test during the demo phase. This ensures the demonstration is realistic, and you are able to have a clearer vision of what needs to be done. Decide to invest in an ERP system is a big decision to make. Maintaining it, ensuring it always stay up-to-date with the changes in technology developments is an even bigger concern. On average, an ERP system can last anywhere between 7 to 15 years. After this mark, an organisation can choose to upgrade their current solution or choose something new. At the heart of the so-called Industry 4.0 is the process of full digitalisation from design to manufacturing. In a study conducted by Boston Consulting Group, while nearly 90% of US manufacturers recognise the potential of manufacturing digitalisation in driving productivity, only 28% see the opportunities to use these technologies to create additional revenue streams. This narrow perspective prevents manufacturers from achieving a more holistic approach to Industry 4.0. By embracing Industry 4.0, manufacturers that are able to obtain a suitable ERP solution can certainly increase accuracy, speed up their competitive advantage through improved processes, and focus on the internal intelligence and knowledge to utilise every resource. Advanced planning and scheduling (a management system that allocates raw materials and production capacity optimally) and Configure price quote (helps speed up the order-to-delivery process) are the two critical functions of the next generation of ERP solution that manufacturers should take into account. In addition, advanced ERP software should also allow you to keep track of the process anytime, anywhere via its mobile application, an essential feature to improve collaboration across departments. Cloud ERP is becoming increasingly popular among small and medium-sized businesses due to its faster implementation, lower upfront capital expenditure as well as the mobility and accessibility features. So, what is cloud ERP? Two main deployment models exist for cloud ERP systems - the SaaS model and the host-based cloud model. In many cases, when vendors mention “cloud ERP”, they are referring to the SaaS model. Not every enterprise accepts this new technology right away, especially in the manufacturing industry. Nonetheless, with the constant change in demands, the legacy system simply cannot help the manufacturers to keep up the pace, and cloud ERP may just have the answers that they are all looking for. Many SMBs are favouring cloud-based solutions as the cloud can satisfy a wider range of requirements. Even the top ERP providers, SAP and Oracle, are starting to rethink their cloud strategies to cope with the changes in the market dynamics. However, the majority of enterprises may already have is an on-premise system that they have been using for years. Moving from on-premise to the cloud even though is not entirely impossible, it still requires lots of consideration and careful planning. Having said that, cloud ERP does have drawbacks that organisations need to be aware of, such as incurring long-term costs, less control over maintenance and contingency activities, harder data integration, etc. TRG International is a software service provider located in Vietnam. We provide modern solutions that help businesses to effortlessly operate their daily activities. TRG International has been Infor’s only partner in Vietnam since 1994. Though lesser known compares to other software giants like SAP, Oracle and Microsoft, Infor has gained tremendous popularity by offering deep industry-specific applications and suites, cloud deployment and extremely user-friendly interfaces. One of Infor’s top priorities is to create products that have a strong emphasis on the latest technological advances and an intuitive user experience based on the customer’s feedback obtained. A variety of Infor’s cloud-based applications are created on Infor Operating Service, or Infor OS, platform utilising artificial intelligence to automate business processes, ensure a smooth and efficient integration. The platform takes care of both front-end and back-end sides, ensuring a friendly, time-saving experience process for all users. Previously known as Infor SyteLine, Infor CloudSuite Industrial holds the key to your company success. It is a fully integrated end-to-end solution offering deep manufacturing functionality, flexibility, and a lower TCO. The solution is built specifically for every facet of the manufacturing process and delivered on AWS, an advanced and highly secure cloud infrastructure platform. Connect anyone, from any department within your organisation to the right insights via standardised business processes and easy to use design. Your end users will be more productive as they now have access to relevant, contextual information to the task at hand, a clearer vision about the relationship with the customers as well as the supplier, and better yet, they’ll be able to prioritised the workloads.